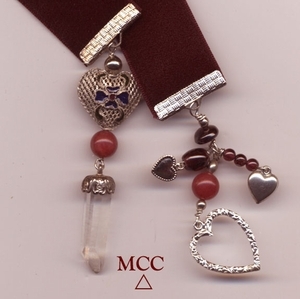 Exquisite to gift or to hold, here is our Illuminator Bookmark in merlot velvet with a beautiful, natural rock crystal capped in filigree. Sample shown. A sterling filigree heart boasts an enamel flower in claret, navy and green...three more silver hearts are in love with garnet and red jade beads. Also an accurate pendulum, it won't mar your literature - 12" long with 5" of wirewrapped charm.